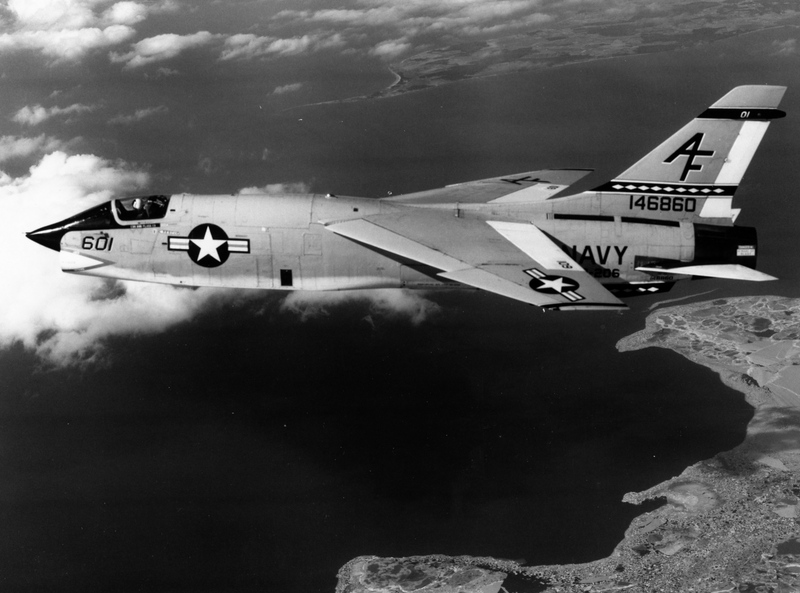 The F8U Crusader was the first carrier-based jet fighter to exceed 1,600 kilometers (1,000 miles) per hour. Its variable-incidence wing, which could elevate up to seven degrees in the front while rotating about its rear spar, helped improve the aircraft's flight characteristics at slow speeds and increase pilot visibility for takeoff and landing. Its folding outer wing tips facilitated storage on aircraft carriers. Improvements were made to the engines and radar, and ventral fins were added under the tail for increased directional stability. Of the 1,261 Crusaders built, 73 were modified as RF-8G reconnaissance models. This RF-8G was the last operational Navy F-8. Delivered as an F8U-1P, it spent its first seven years with the Marine Corps and flew 400 combat hours in Southeast Asia. 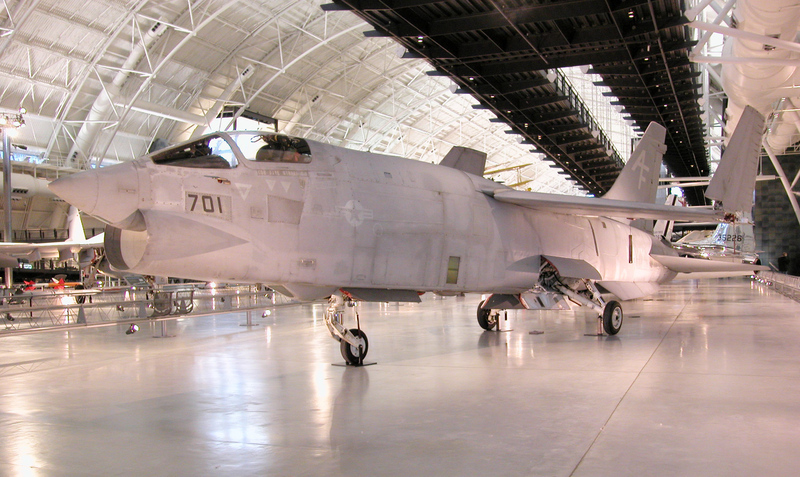 Its career total of 7,475.2 flight hours is the most of any U.S. Navy Crusader built. The F-8 (F8U) Crusader was designed in 1953 in response to a request from the Navy for a new supersonic day fighter. The XF8U-l (Bu. No. 138899) first flew on March 25, 1955 and 5 ½ years later made its last landing and was presented to the Navy on October 25, 1960. 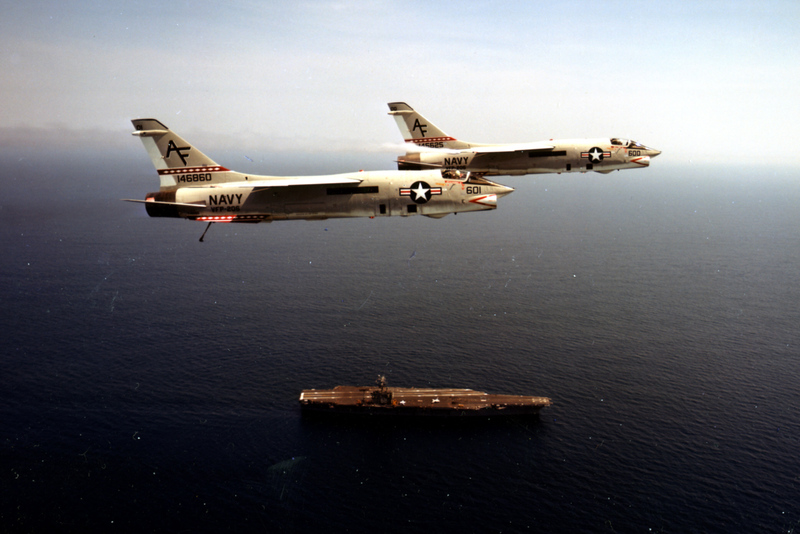 During the Crusader's first five years it achieved an outstanding record as a carrier-based jet fighter. 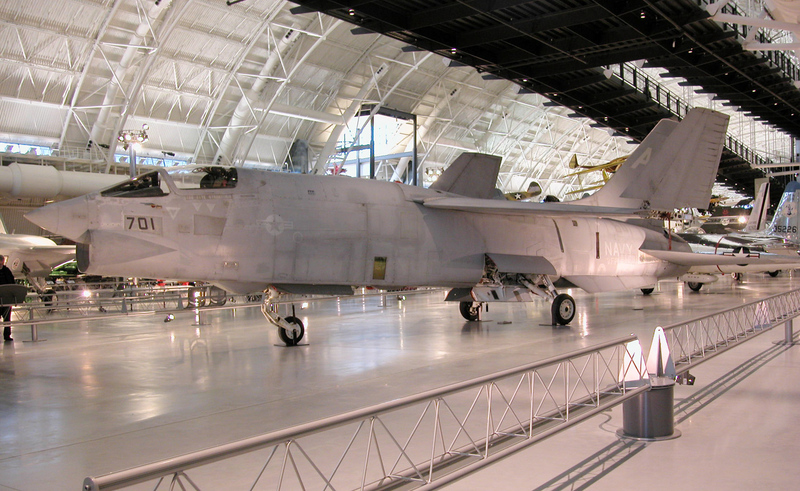 It was responsible for the Navy and Chance Vought being jointly awarded the Collier Trophy for the conception, design and development of the first carrier-based aircraft to exceed 1,000 mph. It set the first national speed record of more than 1,000 mph to win for the U.S. Navy its first Thompson Trophy. And it was the first aircraft to fly across the United States faster than the speed of sound. Several innovations were incorporated into the design of the F8U. The most unusual was a variable-incidence wing in which the wing was capable of being rotated about its rear spar to raise the entire wing, thereby increasing visibility for the pilot. In addition, the entire leading edge and the ailerons could be lowered to increase the effective camber of the wing and consequently reduce approach and landing speed. The outer wing tips were made foldable for carrier storage. Titanium was used as much as possible in the F8U construction. All control surfaces had fully-duplicated hydraulic power systems. With wing and fuselage tanks, the aircraft had an endurance of about three hours. Crusaders were fitted for cannons, rockets, and missiles. As construction of the aircraft progressed, improvements were made to the engines, fire control, radar equipment, and ventral fins were added under the tail section for increased directional stability. The F8U became the F-8 in 1962 with the change in designators for all Navy aircraft. Five variants were produced. Simultaneously with the E-8A model, a reconnaissance version the RF-8A was developed. In 1964 a conversion program for these later aircraft was initiated to include stronger wings and fuselage, wing pylons, and ventral fins, as well as new electrical and navigation systems. After modification, the RF-8As continued their service as RF-8Gs. The F-8 Crusader has a wing span of 35'2" and a length of 54' 6". It has a J57-P-420 turbojet engine with afterburner. With a bomb load of 4,000 lb., the maximum overload total weight is 34,000 lb. The Crusader has a maximum speed of 1100 knots at 40,000 feet and a combat range of 700 miles. A total of 1,261 F-8s were built. RF-8G Bu. No. 146860, Manufacturer No. 103, Squadron No.. AF7Ol was transferred from VFP-206 to the National Air and Space Museum on March 30, 1987. This Crusader was the last operational F-8 in the U.S. Navy. It was built as an F8U-lP by Ling Temco Vought and was delivered as the 66th F8U-lP on 30 September 1959. In the course of its lifetime this aircraft has had 11 overhauls, 260 operational service months, 21.7 operational years and a total of 28 years of Naval Service. 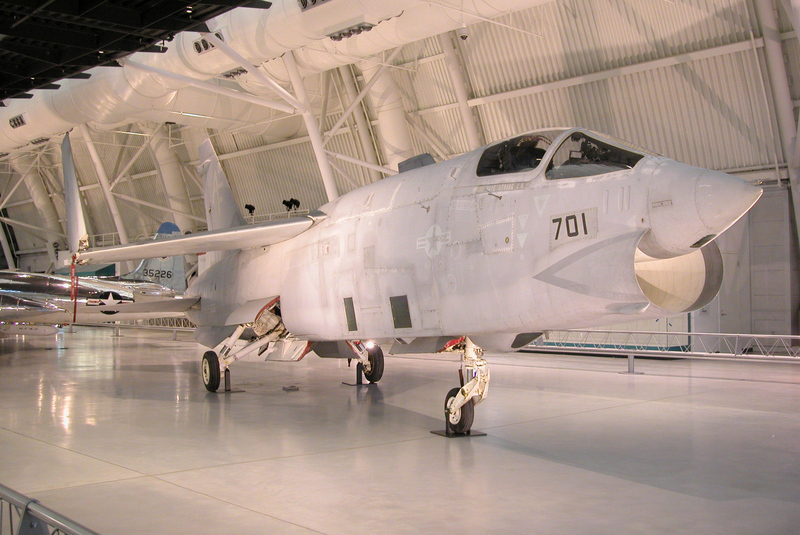 The aircraft spent its first seven years with the Marine Corps, Squadron VMCJ-3, at MCAS El Toro, California, and with VMCJ-l in southeast Asia where it saw 200 combat flight hours. Its record of 7,475 total flight hours is more than that of any other F-8 in history. During its career it made a total of 8,896 landings, 689 carrier arrestments, and 714 catapult shots. Its last carrier landing was in October 1986 and it made its last flight on March 30, 1987, when it was delivered to NASM at the Dulles facility as part of "Project Update 1972." Mersky, Peter, Vought F-8 Crusader, Osprey, 1981. Green, William, and Gerald Pollinger, The Aircraft of the World, Doubleday, 1965. Angelucci, Enzo, and Peter Bowers, The American Fighter, Orion, 1987. Chance-Vought RF-8U Crusader, Curatorial File, Aeronautics Division, National Air and Space Museum. The World's Fighting Planes, William Green, Doubleday, 1968. Chance-Vought RF-8U Crusader, Curatorial File, NASM, Aeronautics Division. All metal structure in three main assemblies. Magnesium alloy and titanium are used in construction. Supersonic, single-seat, single-engine (Pratt and Whitney J-57 turbojet), carrier based fighter (reconnaissance version); outer wing sections fold up forcarrier operations. Grey paint, "701" on nose.